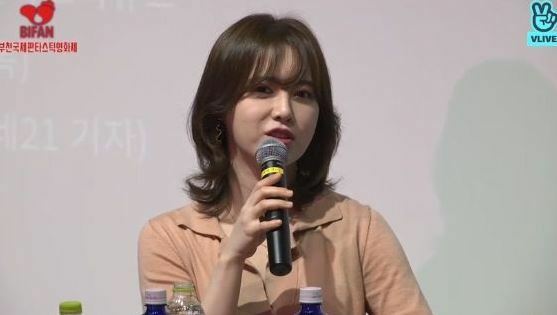 Actress and director Ku Hye-sun addressed recent rumors that she was either pregnant or had undergone plastic surgery. She was invited Saturday to speak with viewers about her new short film “Mystery Pink,” as part of the 22nd Bucheon International Fantastic Film Festival. During an interview, she mentioned the rumors about her weight gain, saying she found it amusing how the matter had garnered attention. She also talked about accepting changes in her body. “At times I do feel sad that time passes by, but I think that I am myself now and will also be myself in the future,” she said. When Ku appeared on the red carpet Thursday at the opening of the film festival, it was pointed out that her face looked swollen. Ku said via her social media accounts that she had simply gained weight from eating too much.